Social media marketing requires an ever-evolving strategy to meet the demands of today’s always-on customers. Here’s a comprehensive guide to help you stay ahead of the curve and ultimately boost your ROI in 2019. Social media is a continuously evolving platform. This means you need to evolve with it, as the strategies and tools you’ve been successful with in the past might not work wonders for your business tomorrow. With the number of global internet users continually growing year-on-year, it’s becoming increasingly challenging to know where they are, what interests them, and how your brand can stay relevant to their needs. And then, there’s ROI to worry about too. The question is, how can you reach 3.196 billion social media users worldwide if you aren’t keeping up with the trends? Getting into their screens is one thing; how do you keep them engaged enough with your brand to turn them into loyal customers? For you to understand the trends you need to keep up with in 2019 better, here’s a quick rundown of where we took off last year and what you should look forward to in the next couple of months. Content marketing continued to be key, with 92% of marketers seeing it as a valuable business asset. Meanwhile, 51% of B2B marketers were expected to increase their marketing budget to create personalized content. This posed a huge opportunity for content automation tools in terms of sales growth, which hit $32 billion last year. There are now 300,000 chatbots on Facebook Messenger, stripping marketers of the tedious task of responding to customer inquiries and concerns round-the-clock. In a separate study, Pew Research Center revealed that Facebook remained to be the most used social channel, with 68% of U.S. adults using the platform to connect with friends and family. Of this demographic, 74% say they visit the site daily, with 51% using it several times a day. This is followed by YouTube, which was used by nearly three-quarters of surveyed U.S. adults and 94% of 18 to 24-year-olds. Influencers remained a key marketing component, with 39% of businesses willing to spend more to reach their desired audiences. In terms of relevance, Instagram was the most significant social media platform for influencers (92%), with Facebook coming in second (77%). In 2018, digital ad investments reached $111.14 billion, exceeding forecasts by almost $4 billion. This year, digital media is expected to account for 55% of total media ad spending. Interestingly, while Facebook remained the most popular platform, Instagram’s ad spend grew 4x more than the amount spent on Facebook ads. Clearly establishing goals and objectives from the onset helps you track your social campaign’s progress, recognize new opportunities and pivot from strategies that aren’t working. While having a clear plan seems like an obvious starting point, a study found that 45% of its respondents have yet to create a digital marketing plan. You don’t want to run a campaign without a clear goal in sight. 2. Identify your biggest challenges. Are you sending your message to the right audiences? Are you present where your customers are spending most of their time? Is your social spending bringing the desired results? Think about your bottlenecks and jot them down. The solutions will come after. 3. List down what you want to achieve. Social media marketing means more than just acquiring more followers on your preferred platform. It could mean building brand awareness for your business, generating leads to help boost your sales, improving your ROI, or creating a loyal fan base. Understand what you want to achieve so you can find out what strategies to use in order to achieve your goals. Understanding your industry standing and what you can do improve it entails research. This lets you know what your competitors are doing, and which opportunities are available for you to take advantage of. Know the keywords they’re using. In an age when search keywords have become powerful tools in helping get into your customers’ feeds, you need to monitor which keywords your competitors are using. Use social media monitoring tools like Unamo Social Media to help you find out which keywords you can leverage for your own social campaigns or track your competitors’ activity on social media. Research about the most shared content by your competitor. Tools like BuzzSumo can help you track your competitors’ most shared content. This lets you know which types of content resonate with their audience. This will also give you ideas for your own content strategy. Monitor what they’re doing on social media. By keeping a close eye on their social activities, you can see what works for them, what doesn’t, and find elements you can incorporate in your own social strategy. Segmenting your social audiences allows you to send the right message to the right people. You may have followers that have already purchased from you. There are those that just recently heard about your brand. You can’t send the same message to those two distinct groups. Segmentation also allows you to retarget custom audiences, depending on their past and current behavior. When you find a group, keep in mind that it’s about being part of a community. This means you don’t just join a group and start posting about your brand. Establish yourself as a helpful community member by providing valuable resources to certain discussions. Joining groups isn’t only a great way to segment audiences, it’s an excellent avenue for building relationships. Make use of tags. Adding tags to your posts will help your customers find the right content they are looking for. Tags could be mentions of people, brands and hashtags, which are used to help people track their desired content better and faster. Tags are also great for narrowing your audience, engaging a group of people who are into a particular discussion. GoPro is an excellent example of a brand leveraging UGC. By reposting their customers’ videos, they’re not only showcasing their products, they’re associating their brand with an adventurous, fun lifestyle. As well, you can simply look for some of the best content from your followers and reposting them. This will encourage others to create content for you as people find being reposted by a brand gratifying. You can also create a contest, where the best UGC gets a gift card from your brand. Get creative with your UGC approach, and you’ll find your audiences being similarly creative in return. Automation has helped streamline a number of important marketing tasks. AI has also allowed for automation to be used in customer service. In fact, digital marketing experts project that by 2020, more than 85% of all customer support communications will be conducted without the help of customer service representatives. Last year, the number of chatbots on Facebook Messenger reached 300,000. Users have become used to interacting with chatbots, so it’s a feature you’ll need to incorporate if you haven’t yet. This not only provides your customers with instantaneous, 24-hour support, it’s also able to guide them along the sales funnel. Letting your customers feel that your brand’s always there for them goes a long way towards building lasting relationships. Video marketing continues to be one of the most effective ways to send your message across your intended audiences. According to Forbes, more than 500 million hours every day are spent watching videos YouTube. Meanwhile, viewers are able to retain 95% of the message when they watch it on video than when reading it in text. Hook your customers in the first seconds. An ocean of content, plus dwindling attention spans means you have short span of time to catch users’ attention. And with the rise of ephemeral content (more on this later), users have become used to deciding if a video interests them or not in an even shorter amount of time. If your message is going to be heard, you need to grab their attention right away. Make it more about your story, not your product. Customers are tired of being bombarded with sales and advertisements. To make your videos stand out, tell stories about your brand. A great example of this is Airbnb’s video on its new logo called Belo. The video showcases how the logo is a combination of people, places, and love—values that represent Airbnb. Don’t forget to use tags! Make it searchable across the web by adding tags. Tags and descriptions add a lot of meat to your SEO, so make sure to use all relevant tags in your video content. Last year, Instagram Stories’ daily active users reached 400 million – making ephemeral content one of the most popular types of content. Promotes brand authenticity. What’s great about short-lived content is that, you’re not bombarding your customers’ feeds. Instead, you’re allowing them to make a conscious effort to check your stories. You can use ephemeral content to show who you are, how you do what you do, and what you have in store for your customers. NASA’s ephemeral content is an excellent example. It humanizes the brand, while giving people a behind-the-scenes look of their different projects. It’s a great tool to let your customers know that you’re always there. Ephemeral content is a great way to keep your customers up to date. It’s also a great way of providing fresh content without flooding their feeds. FOMO. Imagine putting mind-blowing content up on your story and people only have 24 hours to see it. Customers who have already seen it will share the info with their friends, and their friends will hurry to your page to see what the buzz is about. Promoting special offers and flash sales in your ephemeral content is a great way to encourage users to keep checking your stories, playing on their innate fear of missing out. As influencer marketing continues to diversify, you’ll need to put added focus on picking the right influencers for your brand. Connect with influencers who believe in your brand. Nothing beats influencers who are actual patrons of your products. Audiences are quick to notice the authenticity of posts when influencers truly believe in a brand. As well, when an influencer shares the same values with a brand, it leads to a mutually beneficial partnership that’s built to last. Put relevance over reach. Sure, there are a lot of influencers you can tap to help you boost your brand or get more engagements. But you need to make sure that the influencers you choose are relevant to your target audience. Sending your message across a million people won’t matter if they aren’t the people you need to be talking to. Take a look at the content they produce. You need to make sure that they types of content an influencer produces is in line with your branding and your specific campaign. You can also coordinate with influencers about the types of content you want produced. Whichever approach you choose, make sure that you’re both aligned towards the same goals and objectives. Algorithm changes dwindled organic reach. But because it still has a significant impact on SEO, as well as in community building, brands still need to put ample focus on producing organic content. 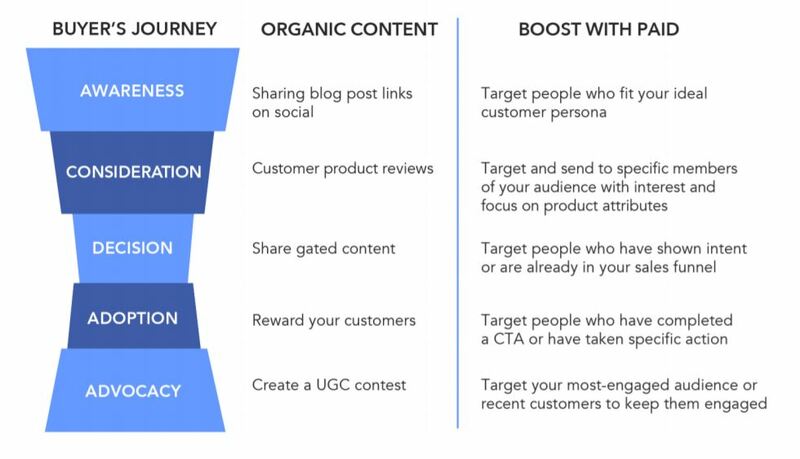 This means that you need to have a hybrid content strategy mixing organic and paid content. For example, if you find that a piece of content underperformed, find out if boosting it would achieve the desired results. If something performs well on, say, Instagram, would boosting it on Facebook work to increase conversions? In 2019, it’s no longer organic vs. paid, but how to intelligently merge the two. Now that you’ve gotten a rundown of this year’s social media trends, remember that you need to consistently track your metrics and measure your social ROI to know how effective your campaigns are and if it’s worth doing for your next activities. Your social strategy is never set in stone. Along the way, you’ll find that some projections aren’t going as planned. This is why it’s important to keep track of your metrics. This allows you to find out what’s working, what’s not, and what you can do to improve it. Then, you’ll also have to find out if your social campaign is worth the resources you’re putting into it. While social campaigns don’t always directly lead to sales, you can assign a value to things like reach, engagement, and directed traffic. Measuring your social ROI gives you a clear idea of how to proceed with your social strategies. Social media marketing is a great way to stay connected with your customers, and build relationships while promoting your brand. There are many features and tools you can use to make social work for your brand. Finding the right mix is where the genius lies.